Skip the live versus plastic Christmas tree debate this year with Kidsonroof’s Totem X-Mas Tree, a flatpak, ready-to-assemble faux fir made from sturdy recycled cardboard. A festive take on the original Totem Tree, the child-friendly holiday edition comprises 150 individual pieces (including candles, doves, and ornaments) that fit into precut notches. And when it’s time to ring in the New Year, simply place the pieces back in the box — no fuss, muss, or grisly trail of needles and tinsel behind you. Skip the live versus plastic Christmas tree debate this year with Kidsonroof's Totem X-Mas Tree, a flatpak, ready-to-assemble faux fir made from sturdy recycled cardboard. 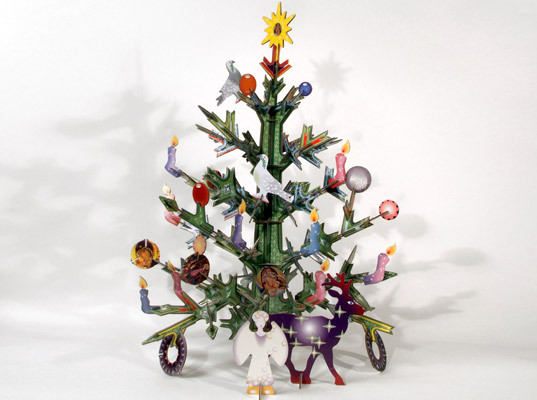 A festive take on the original Totem Tree, the child-friendly holiday edition comprises 150 individual pieces (including candles, doves, and ornaments) that fit into precut notches. And when it's time to ring in the New Year, simply place the pieces back in the box -- no fuss, muss, or grisly trail of needles and tinsel behind you.